AAdvantage members can save 30% on a new individual annual Admirals Club membership when purchased online. Use promotion code AADV30 and click on the Recalculate button at time of purchase. Plus enter for a chance to win an Admirals Club One-Day Pass. American Airlines is sponsoring a new “Transform Your Airport Experience With An Admirals Club Membership” sweepstakes with the winner getting a lifetime membership to the Admirals Club. You even get a 20% discount code you can use on any new membership just for entering. They’ve even put together a fancy, Flash driven micro-site explaining the benefits of Admirals Club membership. 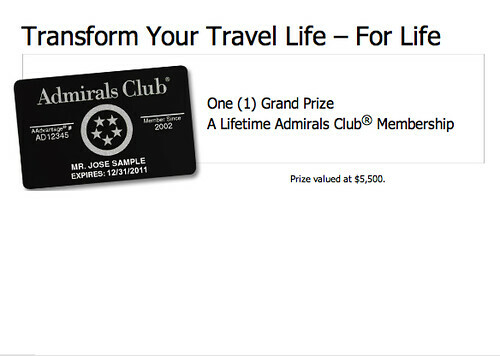 Enter for your chance to win a lifetime Admirals Club membership. We’re offering one lucky traveler the chance of a lifetime, literally. Purchase an Admirals Club membership by December 15, 2010, and use promotion code “LIFE” at time of purchase for 20% off* a new annual membership. You will also be entered for a chance to win the comfort, assurance, and unparalleled service of an Admirals Club membership for life. Read all about it here, get all the rules here, or go here to enter.